In stock -This product will ship today if ordered within the next 4 hours and 26 minutes. 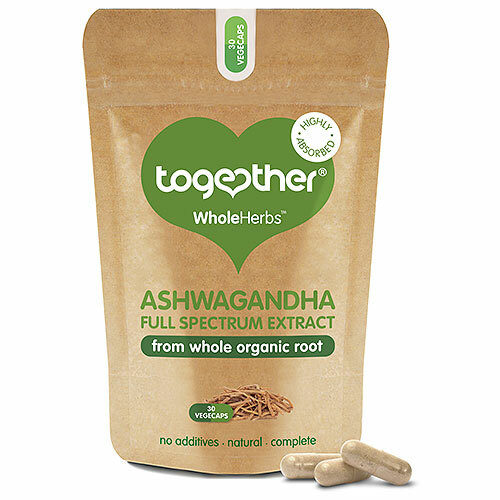 Together’s Ashwagandha food supplement is a high concentration, full spectrum, root only extract. Ashwagandha can support the body by promoting a healthy response to stress, helping to support normal levels of mental clarity and concentration, and enhancing sports performance. This full-spectrum extract is the highest concentration available on the market, retaining all the natural constituents of the herb in its original balance. 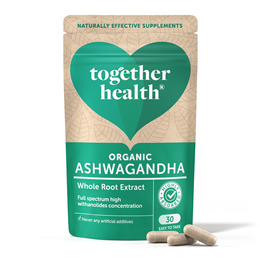 Together’s supplement is also special because it has the highest percentage (more than 5%) of withanolides of all root-only extracts available today. Organic Ashwagandha (withania Somnifera whole root extract), Vegicap (vegetable cellulose). Take one to two vegicaps daily as a food supplement with or without food. 100% plant based vegicap may be split and powder mixed with food or drink. Below are reviews of Together WholeHerb Ashwagandha - 30 Vegicaps by bodykind customers. If you have tried this product we'd love to hear what you think so please leave a review. I think this brand is one of the best. It definitely works for me in that I feel drowsy within an hour of taking it. I take this product to help me to sleep and to reduce my cortisol levels. The product also is said to increase hormone production. Together’s Ashwagandha food supplement is a high concentration, full spectrum, root only extract. Ashwagandha can support the body by promoting a healthy response to stress, helping to support normal levels of mental clarity and concentration.